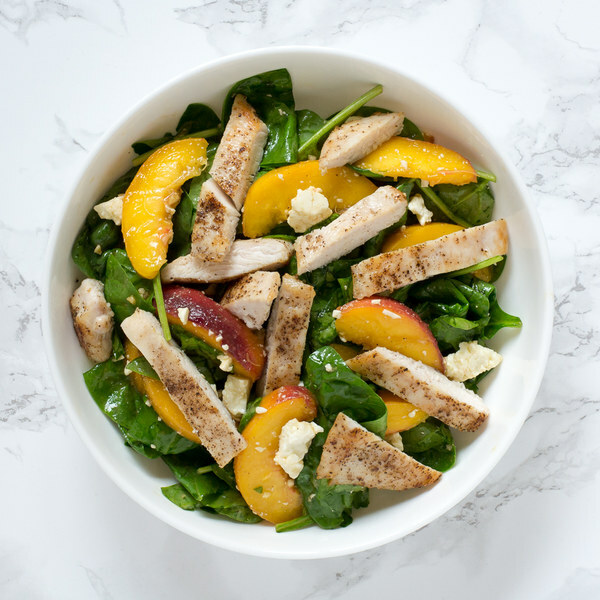 ← Chicken, Peach & Spinach Salad with Feta & Balsamic Vinaigrette. Transfer the spinach to a large salad bowl. Trim off and discard the root end of the garlic; peel and mince or press the garlic. Transfer to a small bowl. Pat the chicken dry with paper towels and place on a cutting board. Holding a knife parallel to the cutting board, cut the chicken in half horizontally to form thin cutlets. Season the cutlets with salt and pepper on both sides. Once the skillet is hot, add olive oil and swirl to coat the bottom. Place the chicken cutlets in the skillet; cook until they are golden brown on the outside and cooked through in the center, 2 to 4 minutes per side. Once done, transfer to a plate. Cook in batches if necessary. To the garlic, add olive oil, balsamic vinegar, Dijon, salt, and pepper; whisk together. Add feta to the salad bowl. Slice the chicken crosswise into strips. To serve, divide the salad between plates and top with the chicken strips. Enjoy!